Montgomery's Cheddar cheese ismade with skill and care, aged in cloth and stripped after a long maturing process. It's golden and glorious, with anutty, complex, real depth of flavour. The Montgomery family has farmed in South Somerset for three generations. Cheese has been made at the farm since before Jamie’s’ grandfather retired there in 1911. Montgomery’s Cheddar has a huge reputation which Jamie has built up over the years, by close attention to all the details that lead to a superb Cheddar: from the diet of his 200 Friesian cows to the traditional ‘pint starter’ used to set the curd. Cheeses are made in small batches, seven days a week. The ‘pint starters’ are more difficult to handle than the powders that so many cheese-makers use, and they create variations in flavour from day to day, but they do give the cheeses great character and complexity. At Montgomery’s, they also use an old, slow peg mill that gives the cheese its characteristic texture. Unlike the very smooth and almost creamy texture of more mass produced Cheddars, Montgomery’s has a texture that is almost brittle, with small fissures throughout the cheese. One of the last three remaining traditional unpasteurised artisan Somerset Cheddars, Montgomery’s is made with skill and care. The cheese is aged in cloth, and stripped after long maturing. It is golden and glorious: rich, nutty and sweet, with a full lingering flavour and the slightly crumbly texture that is characteristic of a properly developed, cloth-bound cheese. Matured for around 14 months, Montgomery’s Cheddar is complex, with a real depth of flavour. We also sell Montgomery's Cheddar Truckles. * This is a hand-made, artisan cheese, which may contain naturally occurring blue veins. These are normal and intrinsic to the nature of this type of cheese and add to its character. We think they taste good too! 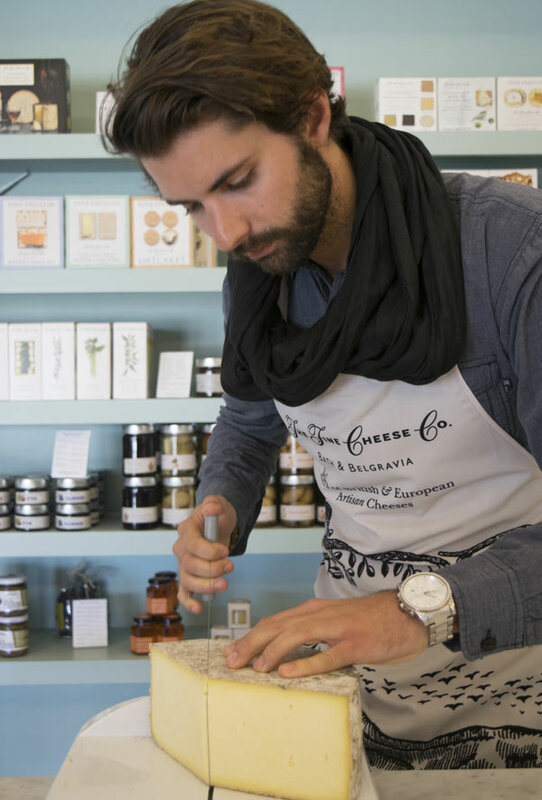 We unashamedly source, care for and sell the best cheese, because that is what we believe in. Every day of dispatch one of our trained cheesemongers cuts every piece fresh, by hand, and wraps it in our waxed paper. We do this because it is most respectful way to treat this precious food.